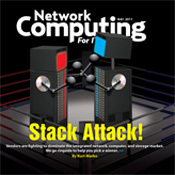 SDN Smackdown: We analyze current tech from Cisco, Arista, HP, Juniper, Dell, Brocade, Alcatel-Lucent/Nuage, Big Switch, Avaya, IBM, and VMware. Which will win your business? Is It Time For SDN 2.0? 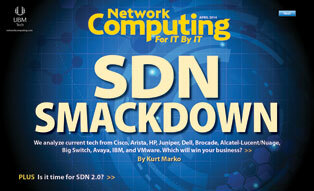 : SDN has been reduced to a buzzword that gets attached to anything a vendor is trying to sell. Application Optimization In A Hybrid World: Need top performance for distributed apps across multiple clouds? Here's how to get it. The Great Server Split: The functional needs and purchasing strategies of cloud providers and enterprise IT are increasingly dissimilar. Vendor Turf Wars: As Cisco, EMC, HP, IBM and others battle for data center primacy, will cooperation be a casualty? Practical Analysis: 802.11ac calls for a clean slate. Virtual Backups 101: Virtual servers need to be backed up just as much as physical servers, but they present new challenges and require new technology. Here's what you need to know. Scale-Out NAS Goes Big Exablox came out of stealth mode recently with an attractive scale-out network-attached storage system aimed at the midmarket. OpenStack Steps Up: The latest open source movement aims to be the platform of choice for hybrid clouds -- and the anti-VMware. Why Do You Want SDN? With all the noise around the "what" and "how" of software-defined networking, many people forget the "why." The Standardization Debate: Two tech experts square off. A CIO compares working without IT standards to anarchy, while a CTO claims that standardization stalls creativity. Next-Gen Data Centers And The Politics Of Standards: New technologies are transforming servers, storage and networks. Welcome To The Revolution(s): Three technologies are vying to upend legacy data center networks. Which one will you back? QoS Comes To Solid-State Storage: Startups are bringing fine-grained I/O quality of service to solid-state arrays. The Virtual Network: From SDN to network overlays, emerging technologies promise to reshape the data center for the age of virtualization. Open Compute Rethinks Server Design: Facebook's Open Compute project is proposing new designs for rack servers to maximize efficiency and streamline maintenance. 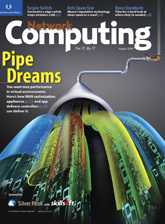 While still a work in progress, the project has real implications for the data center. Data Points: See our latest research on virtualization and software-defined networking. Storage Virtualization Guide From thin provisioning to replication to federation, virtualization options let you reclaim idle disks, speed recovery, and avoid lock-in. Say Goodbye To Static IPs Static IPs break the mobility and flexibility that server virtualization provides. It's time to end this misguided practice. Hybrid Storage The hybrid deployment model is likely to be the first exposure most of us have to cloud storage providers. Private Cloud Blueprint: How to move beyond server virtualization to build a more flexible, efficient data center. The Cloud's Weak Spot: When analysts tout the ease of private clouds, they're referring to the end product. Getting there is anything but easy, Mike Fratto says. Don't Dismiss NAS Protocols: Network-attached storage is rarely given the respect it deserves, according to Stephen Foskett. Hypervisor Derby: Microsoft and Citrix are closing the gap with VMware. Before you roll out the latest edition of vSphere, reconsider your virtualization platform. Cloud Reliability: Into every public cloud a little downtime must fall. We outline the steps to maximize availability and keep you from getting soaked by outages. OpenFlow's Possibilities: Mike Fratto discusses the standards effort's potential to make networks more responsive to application demands. VMware Pricing Changes Cause IT Grief: When vendors make major changes out of the blue, IT goes through five stages of grief. Howard Marks helps you get over it. UC Gotchas: There will be problems with any unified communications project. Learn from those who've worked through them. Making The UC Case: Mike Fratto discusses how to go about it. Battle For The Data Center: Cisco, IBM, Hewlett-Packard, and others want their proprietary, integrated network, server, and storage platforms in your data center. We have the info you need to get the best fit. Smart Remote Management:When critical systems fail and you're hundreds of miles away, remote management can save the day. Here's what you must know to manage infrastructure anywhere, anytime. Mike Fratto: IPv6 isn't Y2K all over again. This rollout will be a whole lot easier. Face Down Virtualization's Storage Challenges: Consultant Stephen Foskett examines new products that will make storage and virtualization work better together. Switch to IPv6: IPv4 is over. Now's the time to lay the groundwork for an orderly transition to IPv6. Here's how to get started. Mike Fratto: Data center vendors are providing more APIs to expose equipment features and functions, which will make automation and product integration easier. Opinion: Consultant Stephen Foskett on how EMC has finally caught up to NetApp with new products that unite NAS and SAN. 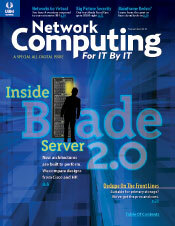 Inside Blade Server 2.0: New blade server architectures are built for virtualization and I/O. We get inside designs from Cisco and HP. Dedupe On The Front Lines: Deduplication is moving to primary storage, where disk space can be three times as expensive as backup. We look at use cases where primary dedupe does--and doesn't--make sense. SIEM Plus: We put AccelOps' security information and event management software in the lab and found a robust platform for monitoring events and more.e sharing, you (or your data) could be doomed. Mike Fratto: The security controls of cloud providers go only so far. You need to know the boundaries to properly manage risk. 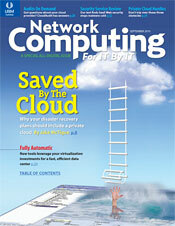 Saved By The Cloud: A private cloud can play a key role in your disaster recovery strategy. We dig into the storage, LAN, and WAN requirements to build a cloud for DR. The Automated Data Center: Gain new levels of efficiency with orchestration and converged networks. Our road map lays out the processes and products to get you there. Audits On Demand: Got security or compliance questions for your cloud providers? A new standards group aims to make it easy for customers to get answers. SaaS Web Security: We test a startup that offers Web malware protection as a service. When it comes to protecting remote users, we like what we saw in the lab. Build Beyond VoIP: The network plays a critical role in the success or failure of your unified communications deployment. We tell you how to build to win. Get Apps In The WAN Fast Lane: Real-time apps like VoIP and VDI need special treatment on the WAN. Here's how to configure and manage traffic priorities. Measuring UC's Benefits: Technology isn't all you have to worry about in a UC deployment. We offer strategies to justify UC costs to executives. Forensics Plus: Security pros need lots of information when investigating breaches. We test NetWitness' NextGen forensics suite to see if it should be part of your toolkit. IT Management Transformed: The IF-MAP spec makes it easier for devices and apps to share status information. It could be the new SNMP. 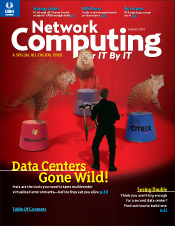 Tools To Tame Virtual Machines: Don't get eaten alive by an untamed virtual environment! We've got products you need to know about to handle hypervisors from multiple vendors. Double Up Your Data Defenses: Data replication to a secondary data center can be tricky. Find out why you should be using VPLS, virtualization, and other technologies. Break Storage Vendor Stranglehold: FCoE and iSCSI have the potential to topple industry practices that keep storage prices high and vendors--not buyers--in charge. Shut Up And Log: Enterprises give three common excuses for not storing and reviewing logs as required by PCI. All three are unacceptable. Tech Insight: We put Tenable's Security Center 4 through its paces and drill down into the architectural differences in scale-out NAS systems. Next-Gen Data Center, Delivered: Unified computing platforms promise to consolidate everything and anything into a single chassis. Energy-Efficient Data Centers: Unless your data center was designed in the last five years, it's not as efficient as it could be. Brush up on the basics. A True Data Center In A Box: Early adopters of the LiquidIQ virtual server say setup and reconfiguration is faster, and it's let them cut back on staff. Much-Needed Monitoring: The latest version of Prism's EventTracker security incident and event management product makes up for old shortcomings. Virtualization promises to add flexibility to WAN optimization appliances and increase options in the cloud.Tread carefully, though, as the kinks get worked out. Application delivery provides effective network performance for remote offices; virtualization cuts costs and boosts resiliency. ConSentry's CS4024 is more than an Ethernet switch; it combines network access control, deep-packet inspection, and threat- and user-access control in one package. Abaca's EPG 1000 is a good fit for small companies trying to stay ahead of spam and for large companies looking to virtualize. Open standards are worth fighting for. The first step is a critical analysis of what's needed.